WildMIDI is a simple software midi player which has a core software synthesizer (softsynth) library that can be use with other applications. WildMIDI was originally conceived in December 2001 as an experiment to see if MIDI files could be played using the same samples as existing software but with much less overhead. The first versions of the CLI player in 2002 were so successful in reducing the overhead that developers from Quakeforge suggested that WildMIDI could be turned into a library. 2003 saw the first implementations of the WildMIDI library with Quakeforge being used as the test application. The 1st official release of WildMIDI was in 2004. Original develop stopped in 2012 at version 0.2.3.5 but was later forked and refactored in 2013 with version 0.3 being released in 2014. Just after 0.3 release, Chris Ison merged the fork in and re-joined development. In July of 2016 WildMIDI 0.4 was release with support for additional file formats. The WildMIDI library uses Gravis Ultrasound patch files to convert MIDI files into audio which is then passed back to the calling application for further processing or output. The API of the library is designed so that it is easy to include WildMIDI into applications that wish to include MIDI file playback. With multiple MIDI file support you can develop applications to mix several midi files together at the same time and use a different patch set for each MIDI file. Cross Platform: Linux, Windows, OSX, FreeBSD and etc. Is this related to Timidity or some other project? 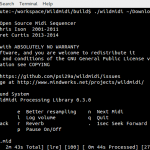 No, WildMIDI was written from scratch by Chris Ison with input from the team at Quakeforge and the assistance of Eric A Welsh. It was further developed by Bret Curtis after the project was abandoned. To of our knowledge there is no shared code between the 2 projects but we may have had similar ideas and influences. Can I use WildMIDI in my projects? Yes, providing you follow the Lesser General Public License version 3 for the library, and General Public License version 3 for the demo player. WildMIDI is a work of love but many have helped to develop concepts and ideas contained within WildMIDI. Chris Ison is the founder and sole developer for over 10 years. There where many from the Quakeforge community that assisted in working out the details of the library. Eric A Welsh developed several re-samplers to experiment with, one of which still remains in the library. There are also many people who have tested, found bugs and submitted patches. C’est quoi un Fichier MID / MIDI et comment l’ouvrir?